Late last year came word about what was described as the most expensive offering to date by My Father Cigars – the Garcia & Garcia. Over the past few weeks, the My Father Garcia & Garcia (sometimes referred to as the Garcia y Garcia) has started to hit retailers with a price of $35.00. In addition to being My Father’s most expensive single cigar, it is also one of the more limited offerings by My Father Cigars. While it is not a “one and done” production, the Garcia & Garcia is being produced in limited quanties and made available to select retailers. In a way, this is similar to the limited distribution model Arturo Fuente employs for OpusX and Drew Estate does for Liga Privada. Recently I’ve had an opportunity to smoke the My Father Garcia & Garcia. Ultimately I found this to be a good cigar, but one that fell short of some of my expectations. The name Garcia & Garcia pays homage to the father and son duo of Don Pepin Garcia and his sone Jaime, who have been the blenders behind the company’s offerings. The story around My Father Cigars is that Jaime Garcia created the original My Father Cigar to honor his father Don Pepin. In a subsequent release, Pepin created a cigar that honored his father with the My Father Le Bijou 1922. Without further ado, let’s take a closer look at the My Father Garcia & Garcia and see what this cigar brings to the table. From a tobacco standpoint, one contributing factor to the high price of this cigar is the incorporation of Nicaraguan Pelo de Oro grown on the Garcia family farms. Pelo de Oro is a Cuban-seed varietal that is prone to mold disease and as a result ends being a low yield crop. This results in limited quantities of the tobacco. The My Father Garcia & Garcia is available in one size – a 6 3/4 x 54 Toro Deluxe. The cigar is packaged in ten count boxes. The Ecuadorian Habano Rosado wrapper of the My Father Garcia & Garcia is definitely one of the darker rosado wrappers I have seen. The wrapper itself is very elegant and its clear it is of high quality. I’d also categorize this as a wrapper than leans on the oily side. While there are several thin veins that are visible, there are very few visible wrapper seams. The Garcia & Garcia is a well-packed cigar. Finally, I also found this cigar had a distinctive barnyard aroma. The band to the My Father Garcia & Garcia is a modified version of the original My Father peach, pink, red, green, gold, and white band. The big difference is that this is an extended band making it the largest band on a My Father branded cigar to date. The lower portion of the band adds a pink / peach – colored rounded frame with the text “Garcia & Garcia” with gold / black elegant cursive font. On the bottom of that frame is what I describe to be a gold colored winged shield with a “G” on it. The left and right side of the lower portion of the band feature a sephia-colored portrait from the My Father Cigars factory. The upper portion of the Garcia & Garcia is similar to the standard My Father band – with a noteworthy change. 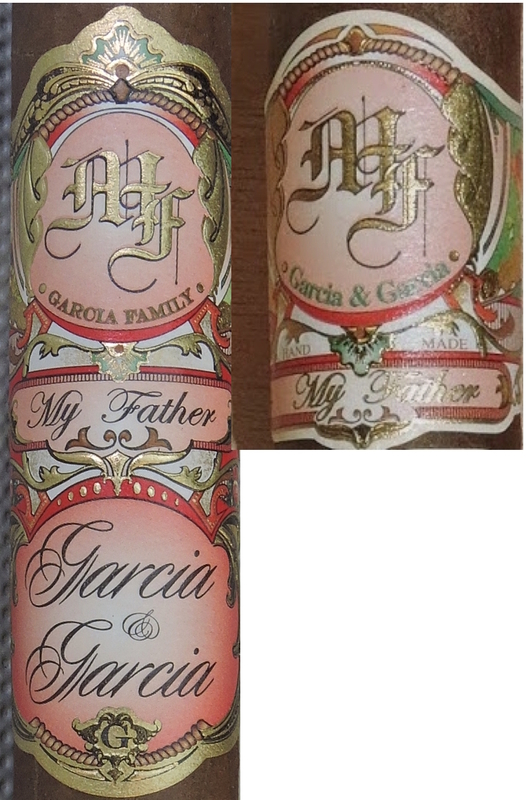 While the standard My Father band has the green font text “Garcia & Garcia” below the “MF” initials on the peach / pink frame, the Garcia & Garcia says “Garcia Family” in gold font. 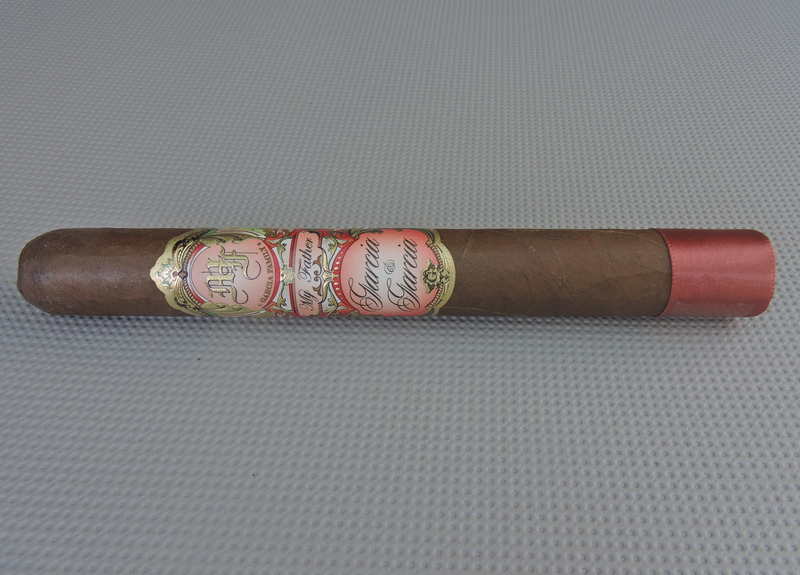 The cigar its finished with a rose colored ribbon around the footer. As I typically do, I went with my usual selection of a straight cut to remove the cap of the My Father Garcia & Garcia. Once the cap was successfully clipped I moved on to the pre-light draw. The cold draw delivered a mix of chocolate, earth, and floral spice. Overall, I considered this to be a very good pre-light draw. At this point I was ready to light up the Garcia & Garcia and see what the smoking phase would have in store. The start to the My Father Garcia & Garcia produced notes of natural tobacco and red pepper. The natural tobacco quickly moved to the forefront and was joined by notes of chocolate. Meanwhile the red pepper receded into the background and was joined by a citrus note. As for the retro-hale, there was a dull (i.e. not sharp) red pepper spice. Throughout the first half, I found the chocolate and natural tobacco to continue be present in the forefront – alternating in intensity. The citrus and red pepper remained in the background. I also detected some baker’s spice in the background. Throughout this part of the smoking experience there was an underlying “twang” present. In my opinion, a twang occurs when notes of natural tobacco, citrus, and pepper come together – which was the case of the Garcia & Garcia. Meanwhile the retro-hale increased in intensity as the pepper became more prominent and developed some sharpness. During the second third, I found all of the flavors to become richer. An earth component joined the natural tobacco in the forefront. The chocolate receded into the background joining the pepper, baker’s spice, and citrus notes. The twang was still very much present. Later in the second third of the Garcia & Garcia, the citrus and spices increased and by the last third, these spices joined the earthy component in the forefront. The citrus notes did not reach the forefront, but remained close secondary note. While there was some natural tobacco in the background, the chocolate had practically dissipated. The end of the Garcia & Garcia was on the spicy side. A cool and firm nub resulted at the close of the cigar experience. Construction-wise, the My Father Garcia & Garcia is as good as it gets – and this resulted in excellent scoring for burn and draw. The Garcia & Garcia maintained a straight burn path from start to finish. A few times, there was a slight curvature on the burn line itself, but this practically self-corrected itself and didn’t result in any additional touch-ups. The resulting ash was silvery gray with some darker speckling. I found the ash to be quite firm – coming off the cigar in nice clean chunks. The burn rate and burn temperature were both ideal. The draw of the Garcia & Garcia was ideal too. It had a touch of resistance – which is something that I like. It also produced a nice layer of smoke throughout the smoking experience. One thing that surprised me out of the gate is that the Garcia & Garcia was a more dialed back My Father cigar. At the start, I found this cigar to be on the upper end of mild to medium in terms of both strength and body. Both attributes increased and by the second third, the cigar was in medium territory for both burn and draw. While the strength and body increased for the duration of the cigar experience, I still found the Garcia & Garcia remained a medium strength, medium-bodied cigar until the end. In terms of strength versus body, I found both attributes balanced each other nicely throughout the smoking experience. First up, the My Father Garcia & Garcia is a good cigar and it is one that will certainly have appeal with many My Father fans. This cigar is a good example for why we use both a Numerical Score and a Stogie Geeks Assessment Rating. Our Numerical Score is based purely on merit and performance and for the Garcia & Garcia it scores a solid 89. It’s not the highest scoring cigar, but that’s still not a bad cigar. On the other hand, for the assessment rating it earns a “2.5 – Try One”. When we adopted the Stogie Geeks rating system on Cigar Coop, it does factor in a price component. 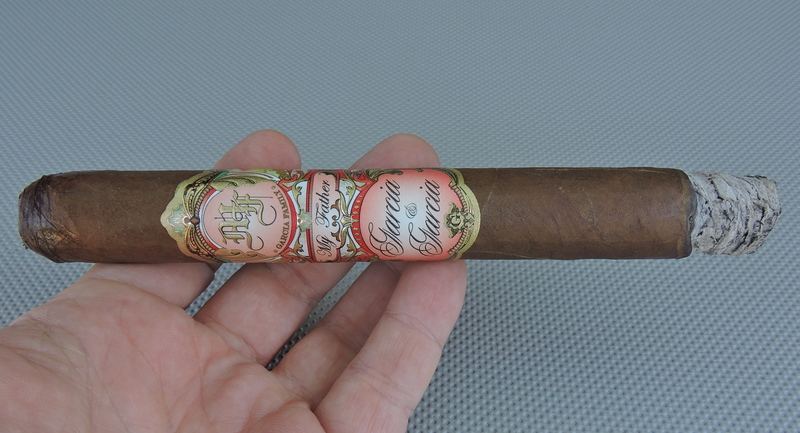 The Garcia & Garcia is a $35.00 cigar – a very steep price point. While it’s a good cigar, it’s up against some very good competition in this category. Perhaps over time, age can make this cigar more competitive. For now, it’s a cigar I’d still recommend trying one – whether you are an experienced or novice cigar enthusiast. As for myself, I’ll have one or two of these in my humidor and see what how it ages. Over the last 4-5 trips to the B&M I have seen this Garcia&Garcia cigar in the shop. I have been wanting to try a single but the $35 price tag keeps me from doing that, $20…maybe I would have. I really wanted to wait and see if you reviewed this cigar first…If it was a “Fight Chuck” cigar I might have picked one up. I also was wondering why they didn’t use some more special leaf (yes I know they are using the Pelo d’Oro), a $35 cigar should have something a bit more unique/special than a Ecuadorian Habano wrapper? One other note…in the 2 weeks this cigar has been in the shop not one has sold (and the MF LE’s fly out of the shop at $20). Anyways, thanks for the review….always a good read!